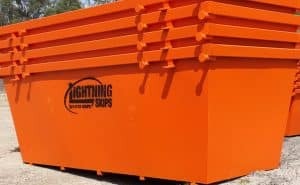 Skip Bin Hire Ipswich - Lightning Skips - Book Now! We deliver same day skip bin hire Ipswich. We generate rubbish every day, but sometimes, there’s just too much to handle at one time. When you have too much garbage in your life, be it from moving or new construction, you’ll need a skip to keep your space clean. We are Lightning Skips, a family owned and operated business that offers skip hire services in Ipswich and surrounding areas. We’ve been running for over 12 months offering a fantastic standard of service that is our commitment to you. If you’re in need of a skip just give us a call, and we’ll guarantee to deliver a skip to you within 24 hours. If you’re able to contact us before 12PM, there’s potential that we’ll get you the skip on the same day. We believe in our speed and we want our prompt skip bin delivery to bear testament to it. We distinguish our skip bin hire service from our competitors with a combination of simplicity and speed. That we will answer your needs without complicating factors that would slow you down. Once you decide that you need a skip, there’s only a few details to sort out. Then we’re ready to deliver a skip bin to you. First, you’ll need to estimate the size of skip bin you’ll need. We offer a broad range of skip sizes, from mini skips ranging from 2m³ to 4m³ to a sizeable 8m³ capacity. These sizes make themselves useful to any of the reasons you might need a skip: renovation, relocation, landscaping, you name it. Our bigger sizes include a door to make access easier. If still unsure which to hire, we have a skip bin size LXWXH calculator to figure out which size would work for you. Second, you’ll need to consider cost. Cost effectiveness is another reason you should hire a skip bin from us. Each of our skip bins come with a fixed price so that you pay exactly for what you need. You will save on getting the optimal size for your needs, putting us above our competitors. Finally, your last consideration is the types of waste you’ll need to be taken away. Our skip bins can take on many things, but it’s important to keep in mind that there are still some things we cannot. Waste types and weight considerations play roles in deciding if we can transport your waste, so make sure to consult the proper guidelines on our site or online. Our usual waste types include general waste, green waste, construction and demolition waste. So lets do it, book with us! Once these finer details are sorted out, you’re already well on your way to getting the perfect skip bin for your needs. So, if you’re looking to hire a skip bin in Ipswich, consider giving Lightning Skips a call on 0472 975 477. Alternatively, you can find our online booking form on the homepage to get a quote or make a booking. Our commitment to speed and simplicity has given us a leading reputation in skip hire services. We know that you want your refuse gone as soon as possible and we’ve made it our commitment to work with you from delivery to pick up.